French World No.5 Camille Serme has been eliminated from the 2017/18 ATCO PSA Dubai World Series Finals after falling to a 2-1 defeat against World No.1 Nour El Sherbini inside Emirates Golf Club. 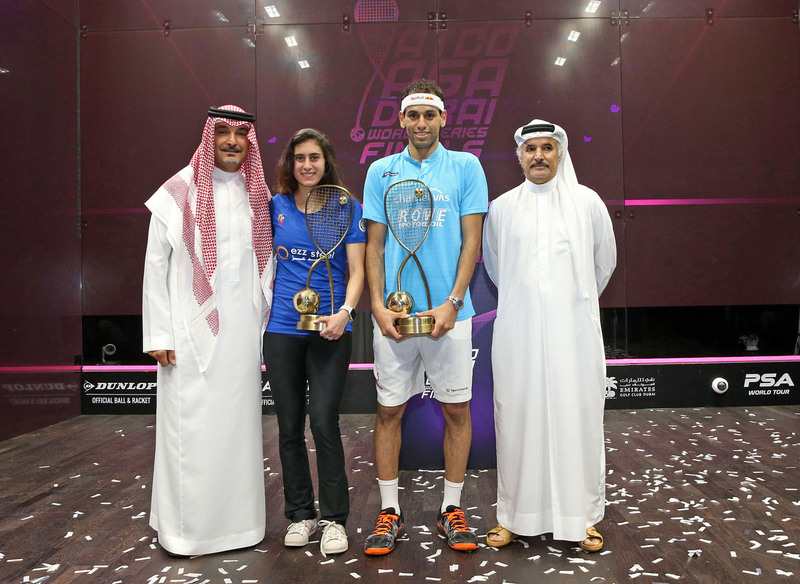 Egyptians Mohamed ElShorbagy and Nour El Sherbini - the respective men’s and women’s World No.1s - triumphed on a thrilling final day of action at the 2017/18 ATCO PSA Dubai World Series Finals to claim the prestigious season-ending titles inside Emirates Golf Club today (June 9). 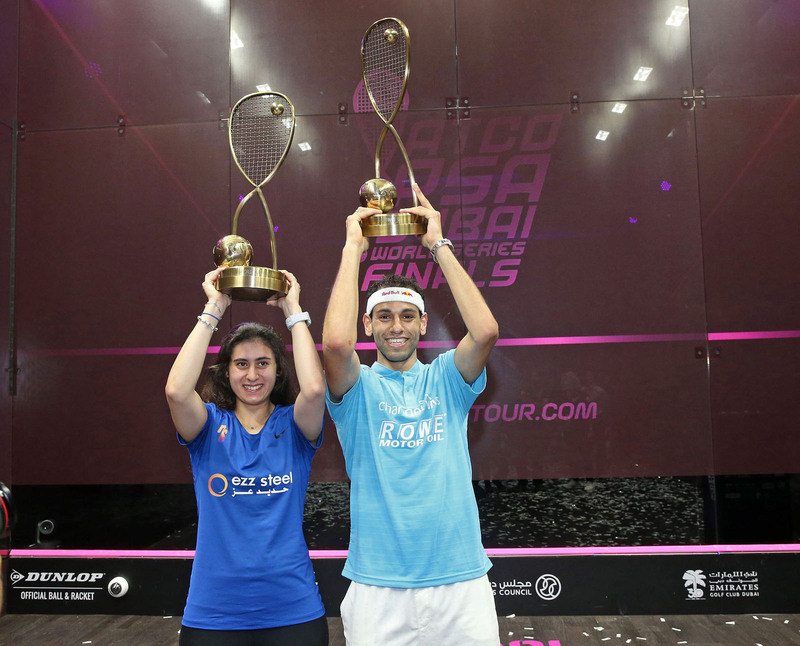 Overcoming compatriots Ali Farag and Raneem El Welily - the respective men’s and women’s World No.2s - ElShorbagy and El Sherbini etched their names onto the trophies to bring the curtain down on what has been one of the most competitive and thrilling seasons in the history of the PSA World Tour - with ElShorbagy successfully defending the title title he won twelve months ago and El Sherbini claiming the coveted crown for the first time in her career. 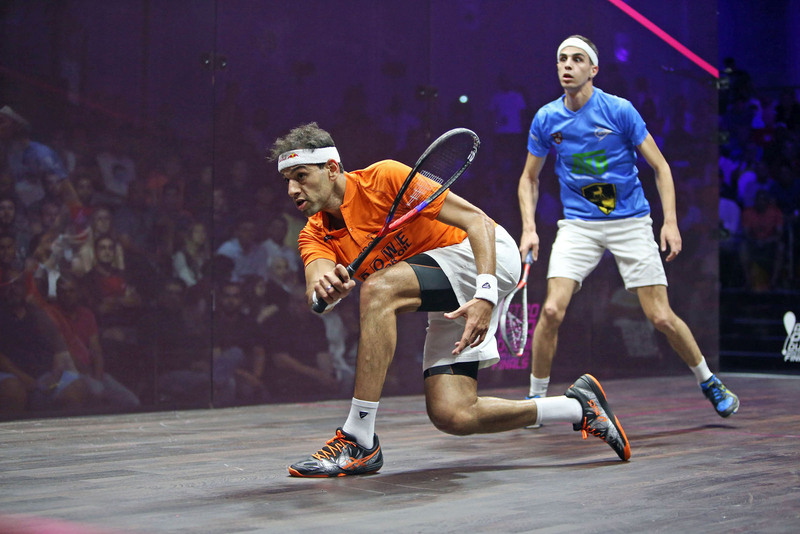 In what was the tournament’s third consecutive staging in Dubai, it was Farag who started stronger against ElShorbagy in the men’s final to take the opening game as he looked to exploits the tired legs of ElShorbagy - with the 27-year-old from Alexandria having reached 12 finals from 14 events played during the campaign. But ElShorbagy showed just why he’s know as ‘The Beast’ on tour as he showed tremendous fighting spirit to level the match before prevailing in a physically punishing third game to set up the platform for victory - which sees him end the season as World No.1, World Champion and World Series Finals champion. 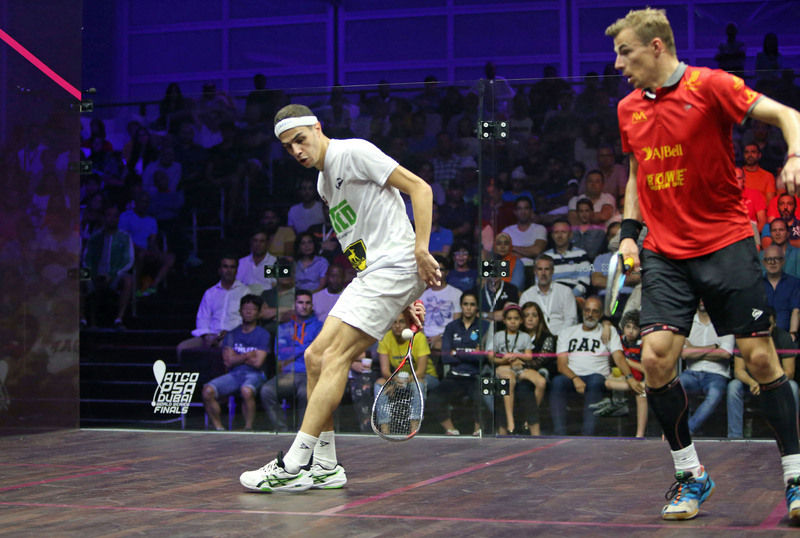 England’s Nick Matthew has played the final match of his glittering 20-year-career after he lost out to World No.2 Ali Farag on a day that saw an Egyptian quartet claim victories to reach the title deciders at the ATCO PSA Dubai World Series Finals taking place inside Emirates Golf Club. 37-year-old Matthew was set to retire after defeat to Germany’s Raphael Kandra at last month’s Allam British Open meant he failed to qualify for the World Series Finals, but a hamstring injury sustained by World No.3 Marwan ElShorbagy saw the Yorkshireman get a late call-up. Three wins out of three saw Matthew top Group A but his tournament - and career - came to an end at the hands of Farag earlier today as he fell to a 11-5, 11-7 defeat. 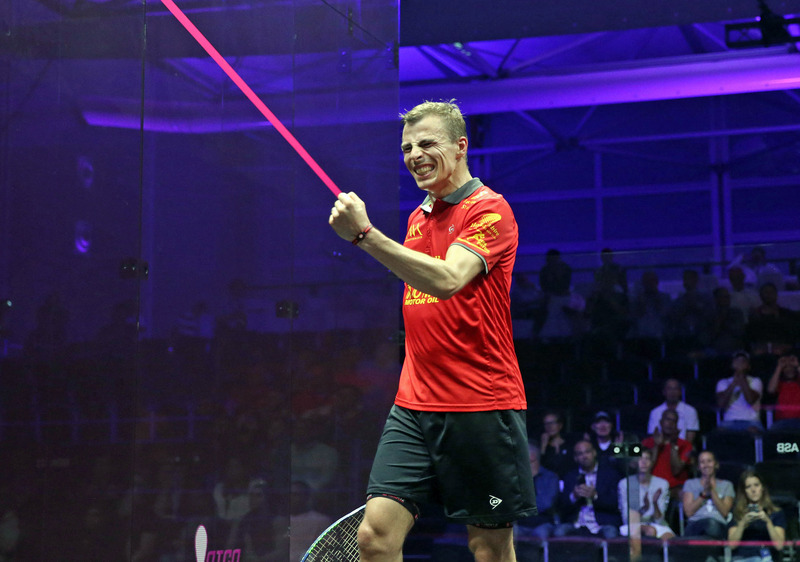 Matthew, the most successful male English squash player of all time, bows out with 35 PSA World Tour titles – including three PSA World Championship crowns – to his name, while he also claimed a trio of Commonwealth Games gold medals. “I dared to dream for a second that I could go all the way but Ali was slightly too good tonight. Even a week ago, if you’d have offered me a semi-final place here I wouldn’t have believed it," said Matthew, who will now take on a coaching and ambassadorial role at England Squash. “A few people this week have been trying to talk me out of retirement but that’s not happening. I’m 100 per cent going to stay in squash, I’m going to have a rest this summer, I’ve got some camps in the US and I’ll have a lot of family time and regroup. Farag said: “It’s extremely emotional, I knew that if I was close to winning that they were going to be the last few points of Nick’s career. “I didn’t want to talk about it at all because I think the more I talked about it the more it would have gotten into my head. Only such a legend would get a standing ovation for around 10 minutes." 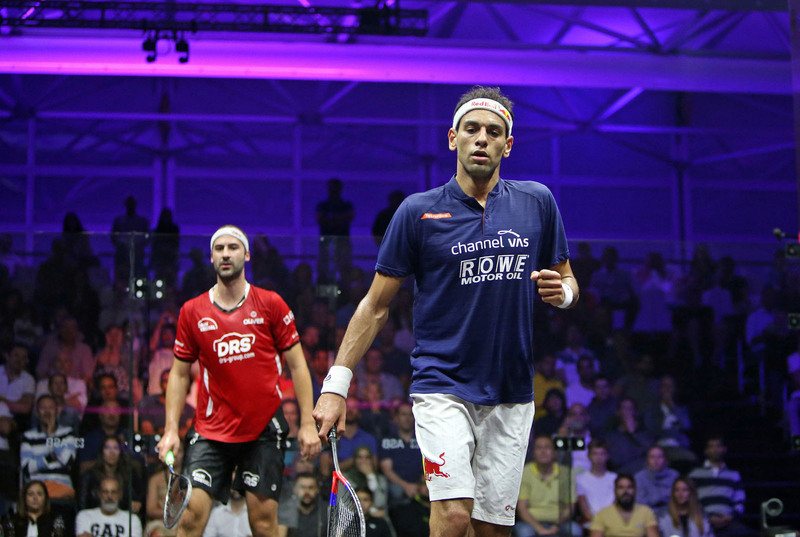 Farag will play World No.1 Mohamed ElShorbagy in the final after the defending champion came through a cracker of a semi-final encounter with Germany’s Simon Rösner in a repeat of their meeting at the same stage of last year’s event. Rösner squandered match ball on that occasion against eventual winner ElShorbagy and, while he wasn’t able to quite get in a winning position again, he made life difficult for the reigning World Champion, but ultimately succumbed to a 12-10, 10-12, 11-3 defeat which sends ElShorbagy through to an 11th final of the season. "Every time it gets tough in any match I always tell myself that I live for these kind of moments, these are the moments I was born for,” said ElShorbagy. 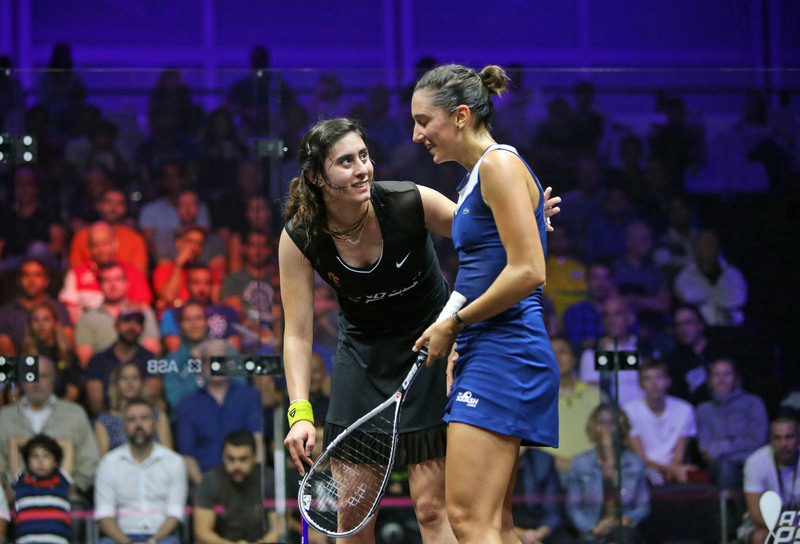 The top two players in the women’s game will go head-to-head in the final as Nour El Sherbini and Raneem El Welily claimed wins over France’s Camille Serme and World No.3 Nour El Tayeb. 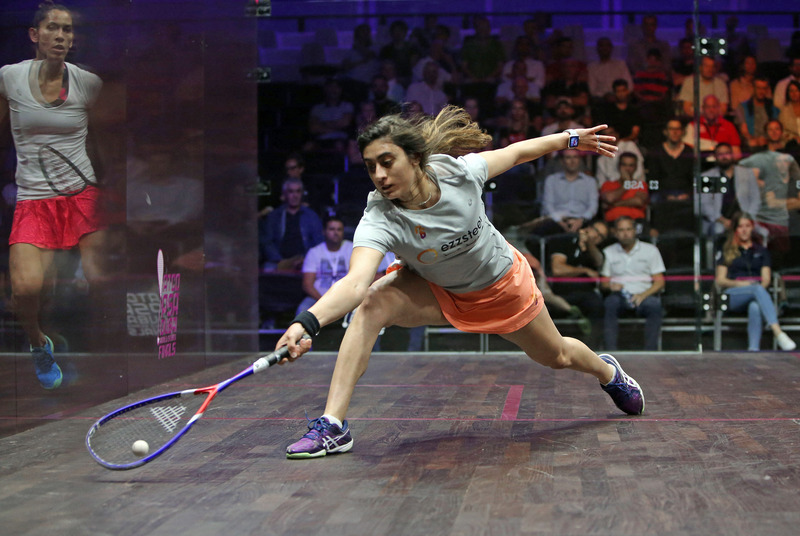 El Sherbini, a losing finalist at last year’s tournament, picked up where she left off after topping Group B with a 100 per cent record as she overcame Serme by an 11-7, 9-11, 11-8 margin to ensure that she will take on El Welily in a sixth major final this season. “It’s always a tough match playing Camille,” said El Sherbini. “It was really hard from the first point and I have no idea what I would have done if it was longer than this [best of three] because I was tired. El Welily, meanwhile, came through a quick-fire victory over El Tayeb to reach the final of this tournament for the first time since 2016. “Nour is a really tough opponent,” said El Welily. “This season has been great for her and we’ve had great battles. But it’s the end of the season, it’s the last tournament and the last push. We’ve all had tough pool matches and I’m happy with the way I pushed myself, even if at the end I let go and gave her a slight opportunity which she almost took." The finals of the 2017/18 ATCO PSA Dubai World Series Finals will take place later today at 20:00 local time (GMT+4). The action will be shown live on SQUASHTV (Rest of World), Eurosport Player (Europe only) and mainstream channels around the world, such as BT Sport, beIN Sports, Fox Sports Australia and Astro. 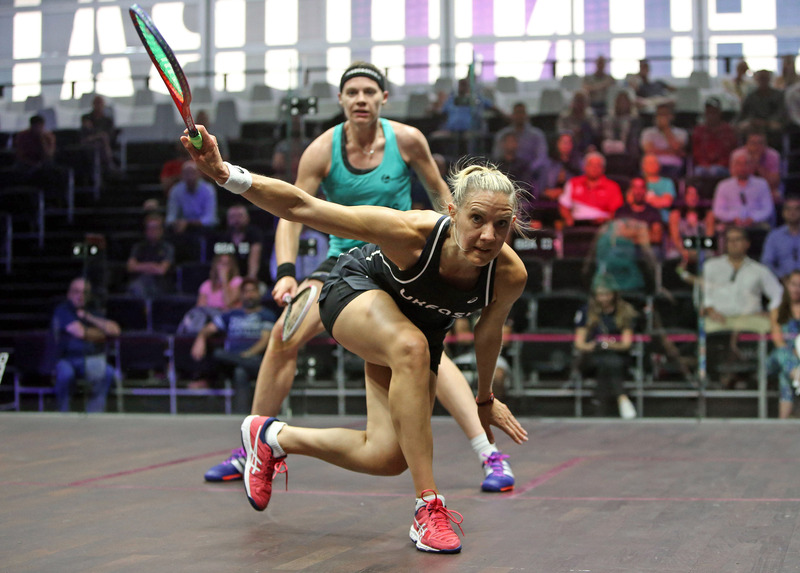 2016 and 2017 tournament winner Laura Massaro saw her hopes of a third consecutive title at the season-ending ATCO PSA Dubai World Series Finals come crashing down following a 2-0 defeat to France’s Camille Serme inside Emirates Golf Club earlier today. Massaro had impressed during the opening two days of action to win both her previous pool matches and assume what looked to be a commanding position atop Group B of the event - played under a best-of-three games round robin format prior to the knockout semi-finals - but defeat to Serme, combined with World Champion Raneem El Welily’s victory over Sarah-Jane Perry, ended the English World No.1’s title-defence. Those results meant that El Welily went through top of Group B courtesy of a superior points won percentage over Serme. “I’m very happy with the way I played today, I managed to relax and play my shots better than the other days,” said Serme. “Laura is such a fighter. She loves playing here and she never gives up, so until the very last point I didn’t want to give her anything. After her match, El Welily said: “I am very pleased to be through to the semis. It’s the second time for me to reach the last four in Dubai. “I can’t help but feel bad for Laura, she won her first two matches but she didn’t qualify. It was a tough group and I’m just glad to be through against such tough competitors. Serme will now go up against World No.1 Nour El Sherbini in the semi-final stage after the 22-year-old Egyptian defeated compatriot Nouran Gohar 2-0 to progress from the group stage with a 100 per cent winning record, while the other semi-final will see El Welily face World No.3 Nour El Tayeb after she came through a shoot-out decider in Group B. 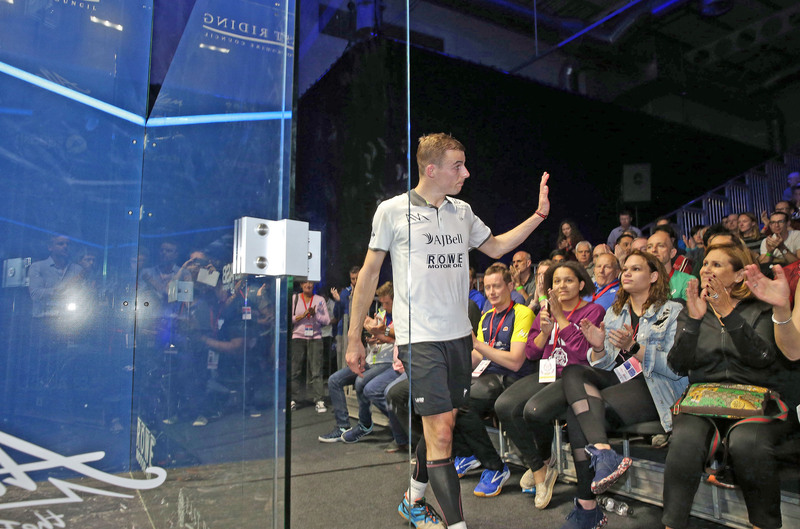 In the men’s event England’s Nick Matthew, the 37-year-old, a late call-up to the event following the withdrawal of Marwan ElShorbagy through injury, cemented his semi-final berth with victory over World No.1 Mohamed ElShorbagy to make it three wins from three at the event. “It was a very unique situation, neither of us quite knew how to approach it,” said Matthew. “It certainly didn’t have the edge of the usual battles between the two of us but I think that both of us at the start of the week would have signed up for the position that we were in. We would have both taken it, getting to the semi-finals with one match to spare and I think whoever we had to play tomorrow, be it Simon or Ali, were both going to be incredibly tough. “Maybe it was a bit easier for Mohamed to turn off the tap and then turn it back on at full speed tomorrow. It’s a bit harder at my age, I think that if I slow down I stop so I try to keep moving and obviously Mohamed was nice and relaxed tonight. I’ve never seen him so relaxed but I’m sure he’ll be back in beast mode tomorrow." He will now face Egyptian Ali Farag in the last four after the former Harvard student prevailed in an all-or-nothing encounter with compatriot, and 2016 World Champion, Karim Abdel Gawad. Both players lost out to German Simon Rösner during the opening two days, while recording victories over Frenchman Gregory Gaultier, but with a semi-final berth on the line it was Farag who came out firing on all cylinders to prevail 11-5, 11-5. “It was very tough today because not only is he a good friend, he’s such a lethal player,” said Farag, who will appear in the last four of this tournament for the first time. “When I had the opportunity I went short and thankfully it worked. Last year I was in the exact same position, I won my first match, lost the second and then it was winner takes all in the third match and I lost to James [Willstrop], who played brilliantly. 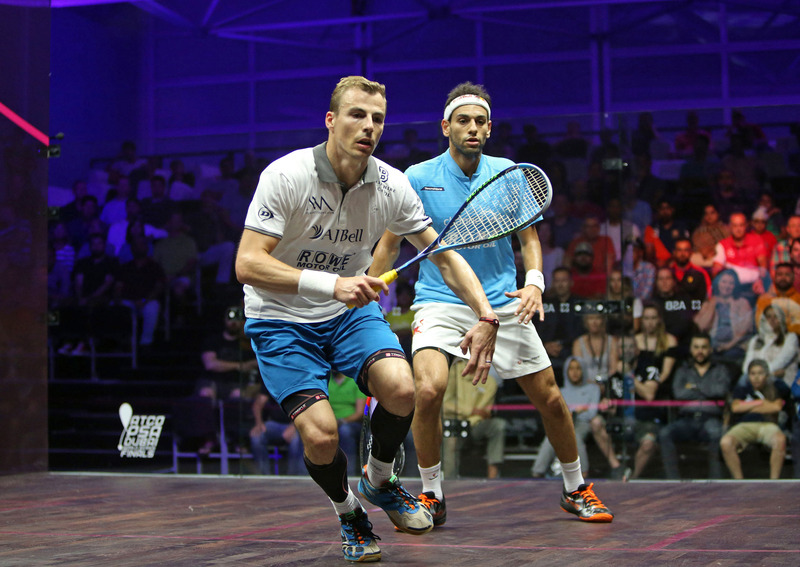 The other winners on the final day of action in the men’s group stages were Rösner and Tarek Momen, who beat Miguel Angel Rodriguez to take third place in Group A.
Rösner will take on ElShorbagy in a repeat of the 2017 event’s semi-finals that saw Rösner squander match-ball to gift ElShorbagy passage to the finale - which he duly won - with the German hoping to exercise his demons from that encounter. 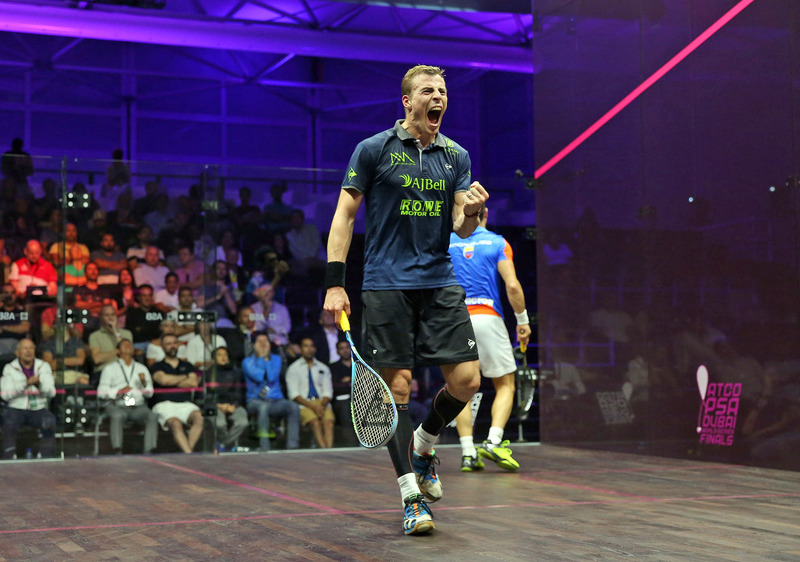 Semi-final action from the World Series Finals takes place at 15:00 local time (GMT+4) later today (Friday June 8) and the action will be shown live on SQUASHTV (Rest of World), Eurosport Player (Europe only) and mainstream channels across the globe, including BT Sport, beIN Sports, Fox Sports Australia and Astro. 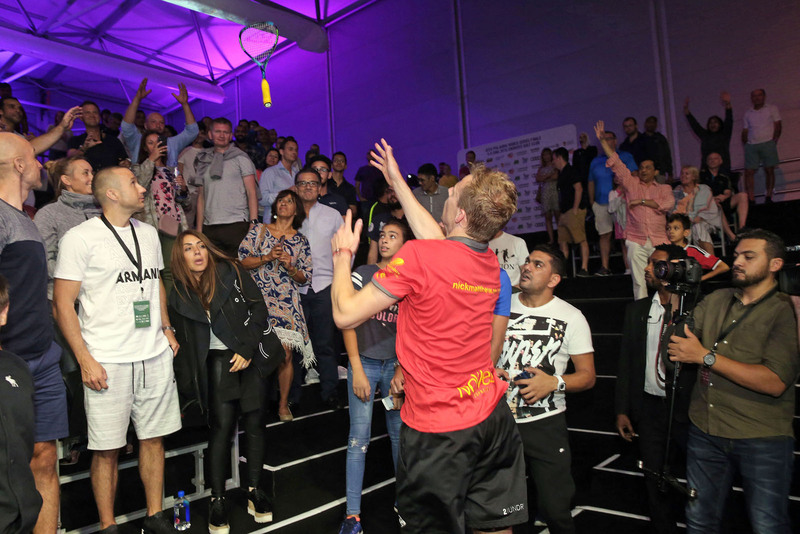 37-year-old Englishman Nick Matthew is still in with a chance of lifting a trophy at his final professional squash tournament after a stunning victory over British Open champion Miguel Angel Rodriguez saw him qualify for the semi-finals of this year’s ATCO PSA Dubai World Series Finals. Sheffield-based Matthew thought his career was over after a disappointing second round loss at the British Open last month, but received a late reprieve after the withdrawal of World No.3 Marwan ElShorbagy, who pulled out due to a hamstring injury, from the tournament in Dubai led to a late call up. And the veteran Yorkshireman is now one win away from a third appearance in the World Series Finals title decider after claiming an epic 11-9, 9-11, 12-10 victory over the in-form Colombian to ensure that he qualified from Group A of the men’s event alongside defending champion Mohamed ElShorbagy, who beat fellow Egyptian Tarek Momen. “I was just summoning every ounce of sweat, experience, willpower, knowhow and a little bit of technique here and there. That was so, so tough, I don’t know how long it was but I’m glad it was best of three. ” said Matthew. "The sport’s come a long way in the last 20 years that I’ve been on the tour. I think about when I started, you had perspex courts which wobbled in the wind, so look how far we’ve come. We’ve got equal prize money, Chicago [the 2018/19 PSA World Championships] is up at the half a million [dollar] mark [for both men and women] and beyond. Germany’s Simon Rösner is the other player to qualify for the semi-finals of the men’s tournament after he came back from a game down to defeat World No.2 Ali Farag - a result which sees the World No.5 guarantee top spot in Group B.
Rösner’s superior head-to-head record over both Farag and 2016 World Champion Karim Abdel Gawad means that he qualifies top of the group. Gawad ended three-time winner Gregory Gaultier’s semi-final hopes and he will take on Farag next to decide who joins Rösner in the last four. “It’s more than I could have wished for to be in the semis after two matches by beating two really good players,” said Rösner, who won the Tournament of Champions earlier this year. “It feels amazing, just like it did last year, but last year there was a difference because I wasn’t sure if I would be in until the very last point that I played against Nick [Matthew] so getting through is amazing." World No.1 Nour El Sherbini is the only player so far to have qualified for the semis in the women’s event as she cruised to a quick-fire 2-0 triumph over World No.3 Nour El Tayeb to claim victory in just 15 minutes, making it two wins out of two. 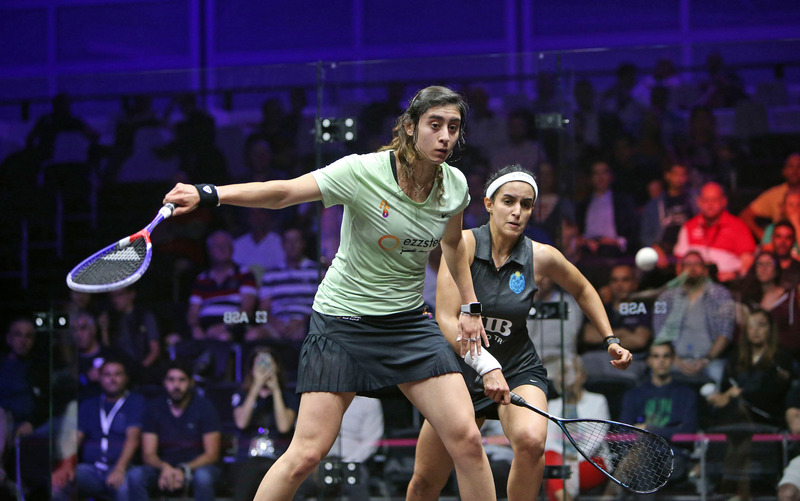 El Sherbini and El Tayeb are the only women to have won multiple World Series titles throughout the 2017/18 season and it was El Tayeb who prevailed the last time the pair met in the quarter-finals of February’s Windy City Open – a tournament El Tayeb went on to win. 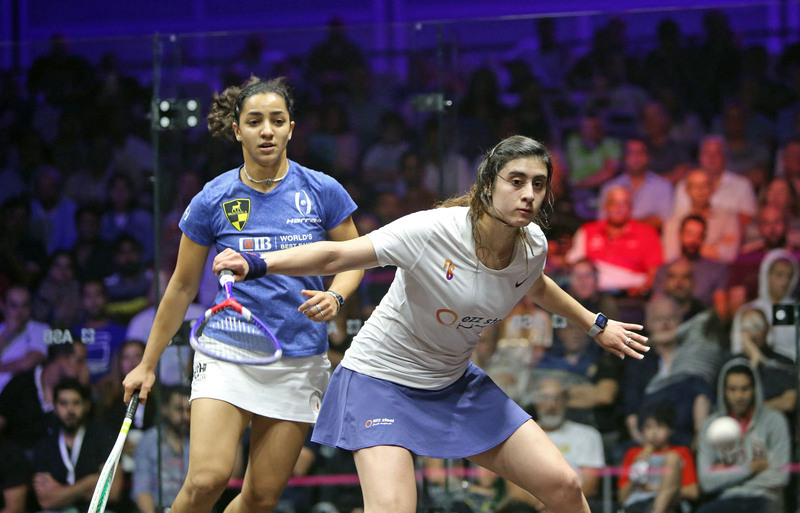 El Tayeb made a strong start here yesterday as she eased to a 13-minute win over World No.6 Nouran Gohar but she was on the back foot from the off today as El Sherbini held her compatriot at arm’s length and gave her very little opportunity to show off her impressive shot-making skills, with the 22-year-old storming to an 11-7, 11-5 victory to qualify from Group A. “I’m so happy to win this match, I think last time I lost to her and she’s doing really well this season,” said El Sherbini, who was runner-up at last year’s event. “She’s up to No.3 in the world but I’m really glad I managed that I didn’t lose a game, it was really important to win this in two games. “She can kill any shot from anywhere and know matter how good a shot is she can get it back. I had to be ready for any surprises from her because I don’t know what she’s going to do, so I needed to be ready." New Zealand’s Joelle King and World No.5 Nouran Gohar were the other players in action in Group A, with the former winning to set up a semi-final playoff with El Tayeb next. Group B sees defending champion Laura Massaro lead the way courtesy of a 2-1 victory over England teammate Sarah-Jane Perry. Preston-based Massaro is eyeing up a hat-trick of World Series Finals titles after winning the previous two iterations of this tournament and she moved to within one win of a semi-final berth after a 2-1 victory over Perry in a feisty match which saw the pair have some heated words at the end of a captivating contest. “I’m quite angry to finish that match like, especially in comparison to how I ended yesterday. At the end of the day I won." World Champion Raneem El Welily defeated French World No.5 Camille Serme in the day’s other match to ensure that it’s all to play four in Group B. If Serme beats Massaro and El Welily gets the better of Perry, then it will come down to the percentage of games won to decide who qualifies for the last four. The final day of group stage action begins at 15:00 (GMT+4) later today and will be shown live on SQUASHTV (Rest of World) and Eurosport Player (Europe only). “I didn’t think I would win it last year to be honest, everyone keeps saying ‘how do you feel about three times?’ and I can’t believe I won it twice," said Massaro, who beat World No.1 Nour El Sherbini in the final of last year’s event. "It really is one match at a time and as [Mohamed] ElShorbagy said yesterday, every match that you play can be like a World Series final and you prepare as if it is a final. “It’s the first match and you could play Joelle in the final of a World Series event, so it’s hard to play her in the first round. I’m glad I fired myself up and won the first game." “I made peace with it when Miguel went on and won. If he’d made the quarters and edged me out by five points then maybe it would have been ‘what if’ but when someone wins a tournament like that and goes to six in the rankings then you have to hold your hands up and say it’s incredibly well-played. I had made my peace and then I got the call!" 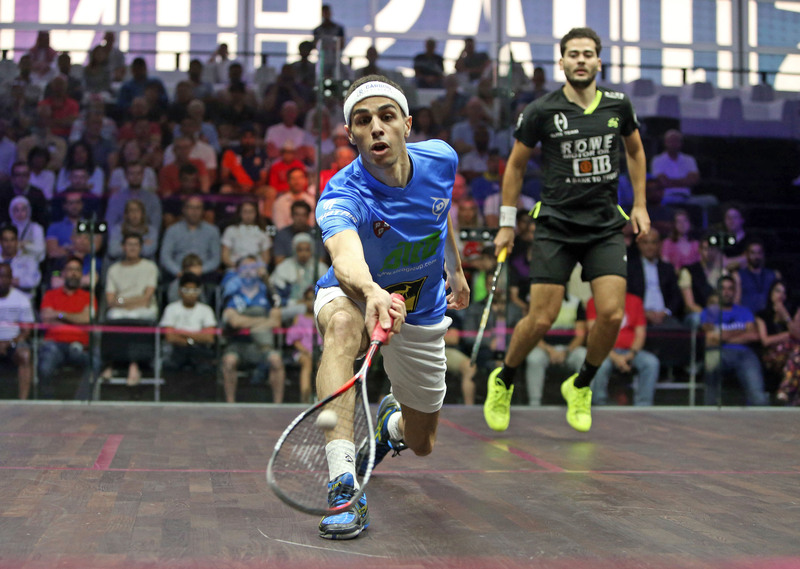 Egypt’s World No.3 Marwan ElShorbagy has withdrawn from next week’s ATCO PSA Dubai World Series Finals due to a hamstring injury - meaning three-time World Champion Nick Matthew will make the final appearances of his career at the season-ending tournament held at Emirates Golf Club between June 5-9. 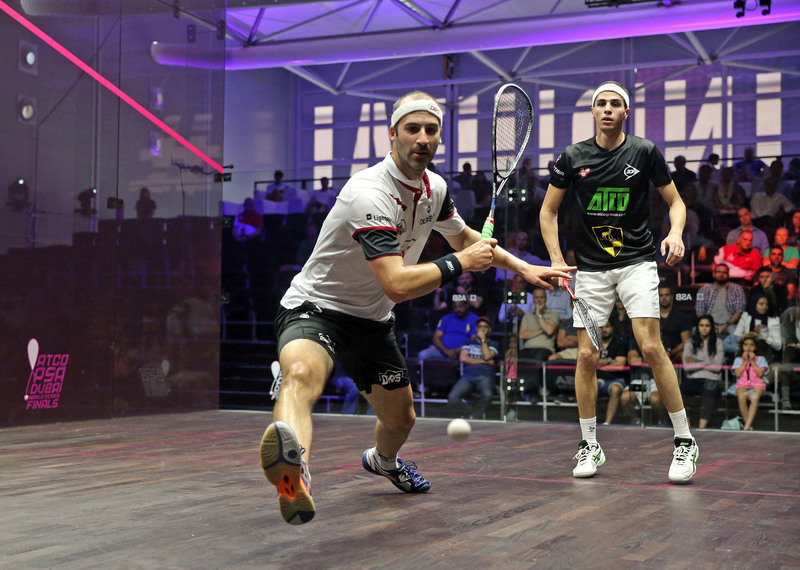 Defeat to German qualifier Raphael Kandra at the Allam British Open earlier this month saw Matthew finish ninth on the PSA World Series Standings, which meant he missed out on a top eight place which would have seen him qualify for Dubai. 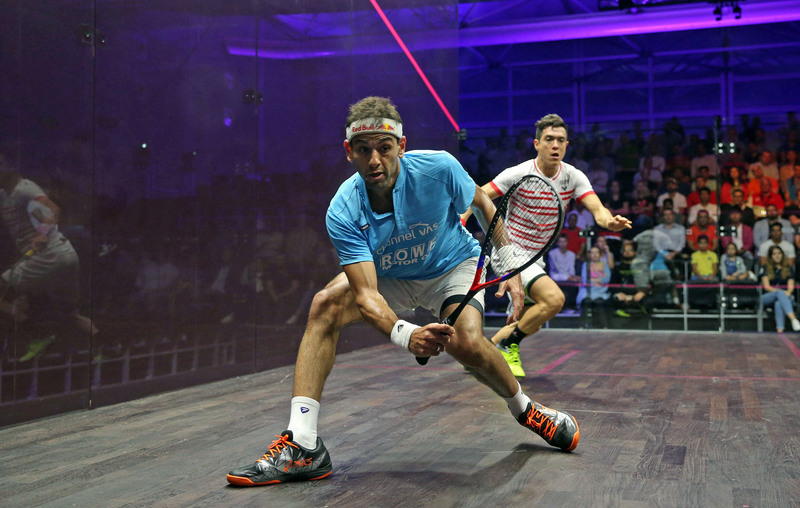 That match against Kandra looked set to be the 37-year-old’s last ever match on the PSA World Tour as he entered retirement but ElShorbagy’s withdrawal has handed the Englishman one last chance to bow out in a blaze of glory. 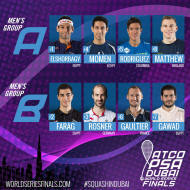 Matthew replaces the Egyptian in Group A of the men’s tournament, which also contains Marwan’s older brother, World No.1 Mohamed and British Open champion Miguel Angel Rodriguez, while World No.4 Tarek Momen moves into Group A.
Momen switches places with three-time winner Gregory Gaultier, who moves into Group B to sit alongside World No.2 Ali Farag, Tournament of Champions winner Simon Rösner and former World No.1 Karim Abdel Gawad. The World Series Finals features a round robin, best-of-three games group stage format and Matthew will get his tournament under way against Momen at 22:15 local time (GMT+4) on the first day of the tournament. The group stages take place between June 5-7, while the semi-finals are due to take place from 20:00 on June 8, with the finals beginning at 20:00 on June 9. 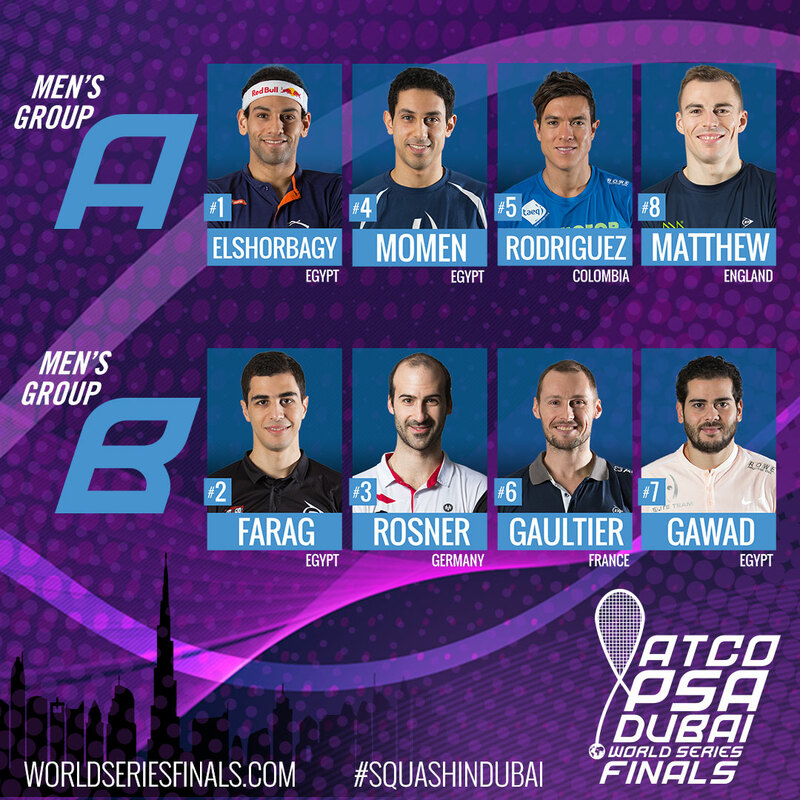 2018 Allam British Open champion Miguel Angel Rodriguez and the man he beat in the final of that tournament - Egypt’s World No.1 Mohamed ElShorbagy - are set to clash once again after they were drawn together in Group A of the men’s event for the season-ending ATCO PSA Dubai World Series Finals, which takes place at Emirates Golf Club between June 5-9. The lucrative tournament - which offers an equal prize purse of $320,000 across the men’s and women’s events - brings together the top men and women on the PSA World Series Standings, with players earning qualification points at each World Series event contested during the 2017/18 season, to face-off against each other in a round-robin best-of-three game series between June 5-7 for a place in the knockout semi-finals and beyond - with only two players progressing from each group of four. Rodriguez’s heroics at last week’s British Open saw him oust three-time World Champion Nick Matthew to earn his place in Dubai for a second time in three years, while he also became the first South American player ever to win a World Series title after overcoming defending World Series Finals champion ElShorbagy in a thrilling 102-minute battle. 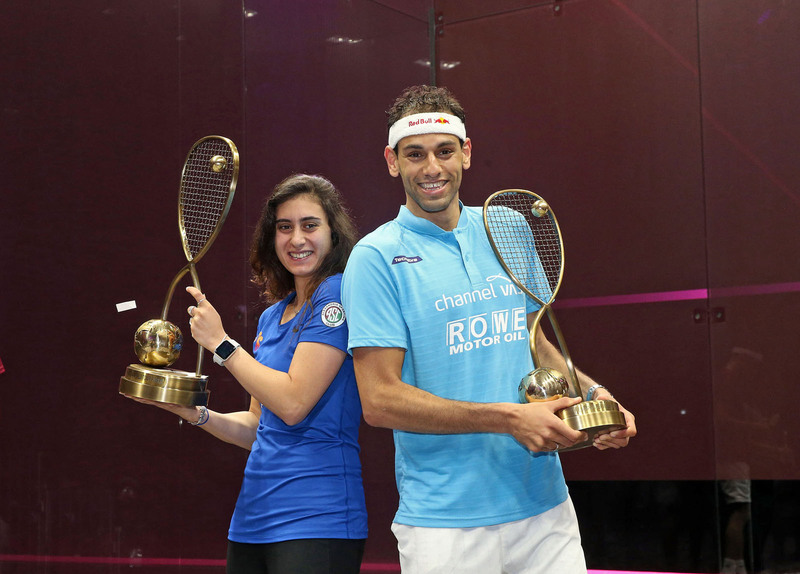 The duo have been drawn against three-time World Series Finals champion Gregory Gaultier and Mohamed’s younger brother Marwan, who claimed a maiden World Series crown last month at the El Gouna International, in what promises to be a compelling group. World No.2 Ali Farag heads up Group B in the men’s event and is joined by Tournament of Champions winner Simon Rösner, World No.5 Tarek Momen and 2016 World Champion Karim Abdel Gawad. 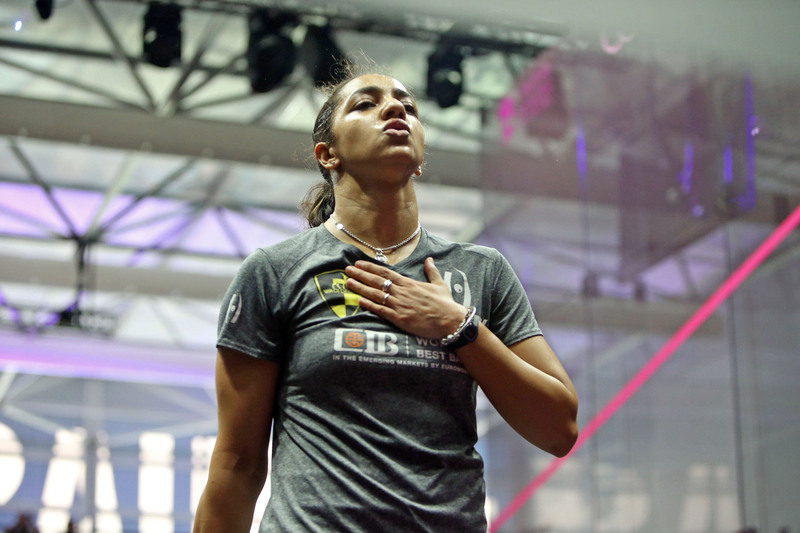 The five-day event brings together the cream of squash talent and there promises to be plenty of drama in the women’s event too, with last year’s runner-up Nour El Sherbini, the current World No.1, drawn together with World No.3 Nour El Tayeb - who alongside husband Ali Farag won the U.S. Open in October - Windy City Open runner-up Joelle King and World No.5 Nouran Gohar in Group A. 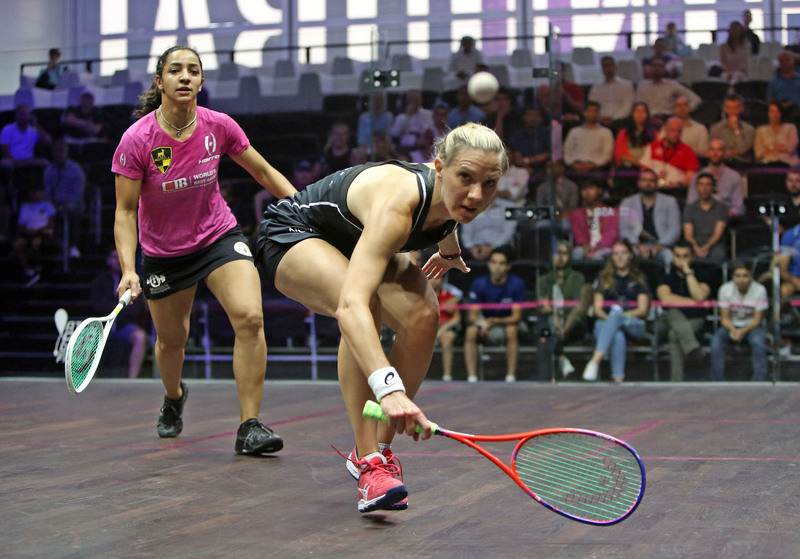 Defending champion Laura Massaro is drawn against reigning World Champion Raneem El Welily as she aims to claim a third successive World Series Finals title, while World No.6 Camille Serme and World No.8 Sarah-Jane Perry make up the rest of Group B. The Group stages will get underway on June 5th with Group B action - starting with Sarah-Jane Perry v Camille Serme and Simon Rösner facing Karim Abdel Gawad - beginning at 3:00pm local time, with Group A action, including a repeat of the men’s British Open final between Rodriguez and ElShorbagy, taking to court from 8:00pm local time. Group stage matches will take place at 3:00pm, 3:45pm, 4:30pm and 5:15pm (Group B) and 8:00pm, 8:45pm, 9:30pm and 10:15pm (Group A) between June 5-7 with the semi-finals due to take place from 8:00pm on June 8. The finals will commence at 8:00pm local time on June 9. Every match from the tournament will be shown live on SQUASHTV (Rest of World) and Eurosport Player (Europe only), while the semi-finals and finals will be broadcast live on mainstream channels across the globe, including BT Sport, beIN Sports, Fox Sports Australia and Astro. 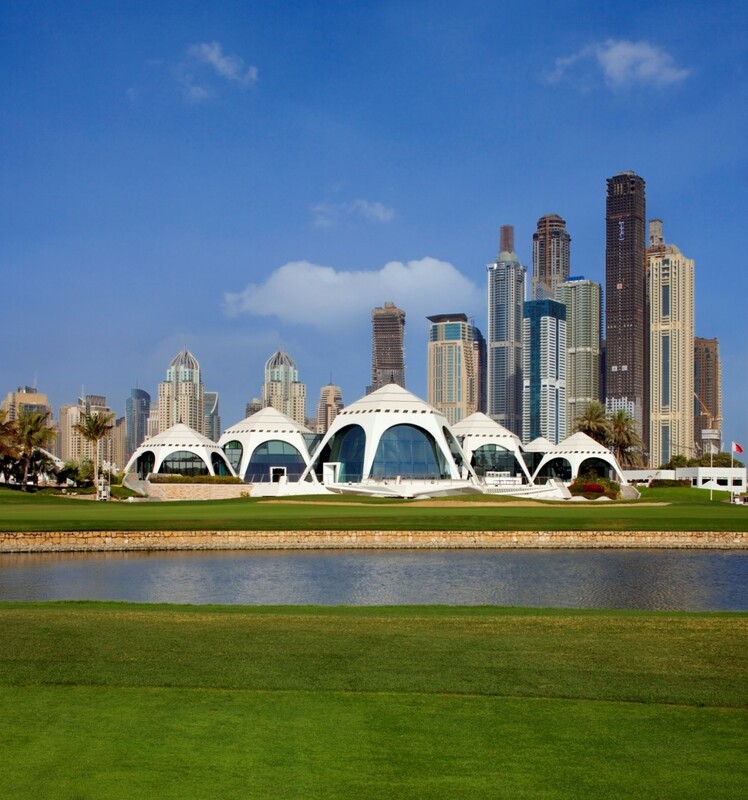 The agreement, which was reached in association with event management company JK58, means that Emirates Golf Club will become the latest stunning venue in Dubai to showcase the PSA World Series Finals, with the 2015/16 edition held in the shadow of the world’s tallest building - the Burj Khalifa - while the 2016/17 instalment saw squash become the first sporting event ever to take place at Dubai Opera. 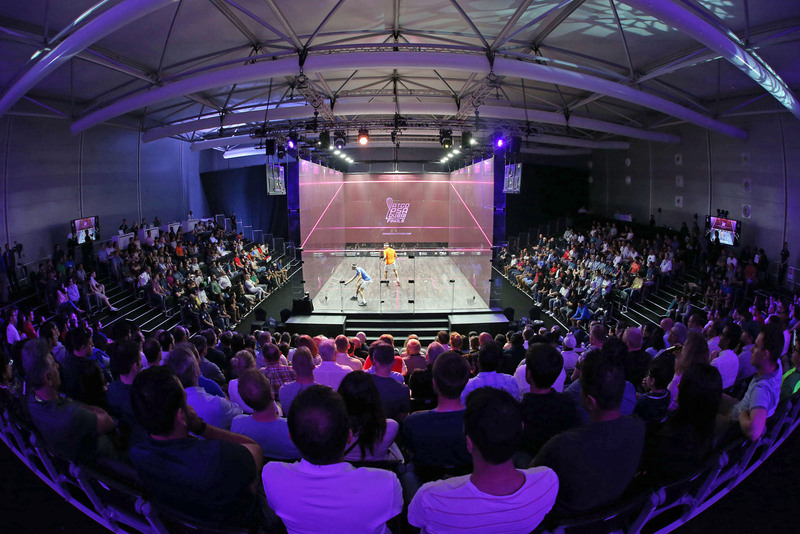 “The World Series Finals is a showcase event for squash, something that fits perfectly with Dubai and Emirates Golf Club and I look forward to welcoming some of the world’s finest athletes back to Dubai again on June 5." In order to qualify for the PSA World Series Finals, players must finish in the top eight on the PSA World Series Standings, with points on offer at all eight World Series tournaments throughout the 2017/18 season and nine players - five men and four women - have already qualified after stellar performances in the first five events. 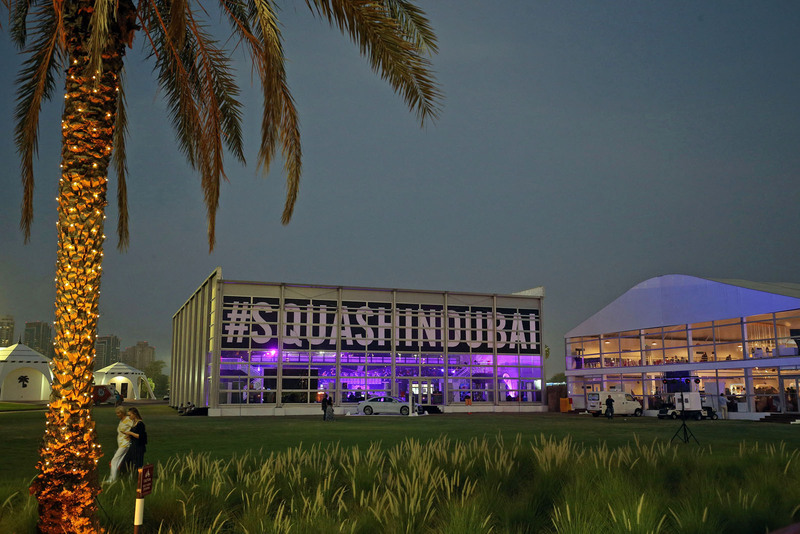 With an equal prize purse of $160,000 on offer in both the men's and women's tournaments in Dubai, the five day event will bring together the cream of squash talent - with players playing round-robin best-of-three matches as they battle for a place in the knockout semi-finals.